An interview with Filipino artist Ronald Ventura. Like many emerging artists, early in his career Ronald Ventura tended to sell everything he produced. Now that his reputation is firmly established and he is dreaming of one day setting up a contemporary art museum in Manila, the 39-year-old auction star has found himself in the unenviable position of going back to collectors to buy back key pieces. Ventura has seen the auction prices for his recent work soar in the past few years. The 2011 “Grayground” — a large-scale graphite, oil, and acrylic painting of horses in the midst of battle — was sold that same year to a phone bidder at Sotheby’s Hong Kong for $1.1 million, the highest auction price recorded for a contemporary southeast Asian painting at the time. Yet the Filipino artist says he was stunned to find out how much some of his older works had appreciated. “A couple of years ago, I was looking for a good drawing that I had done. Most of my drawings are usually covered in paint, but I was looking for a drawing that wasn’t. When I found out the price I was shocked. I couldn’t believe it. It was 10 times more than the original gallery price,” he said, his laugh underscoring his mixed emotions at the steep price increase. The artist has learned his lesson. He says he now keeps one artwork from every solo exhibition. At the rate his pieces are selling, he should. 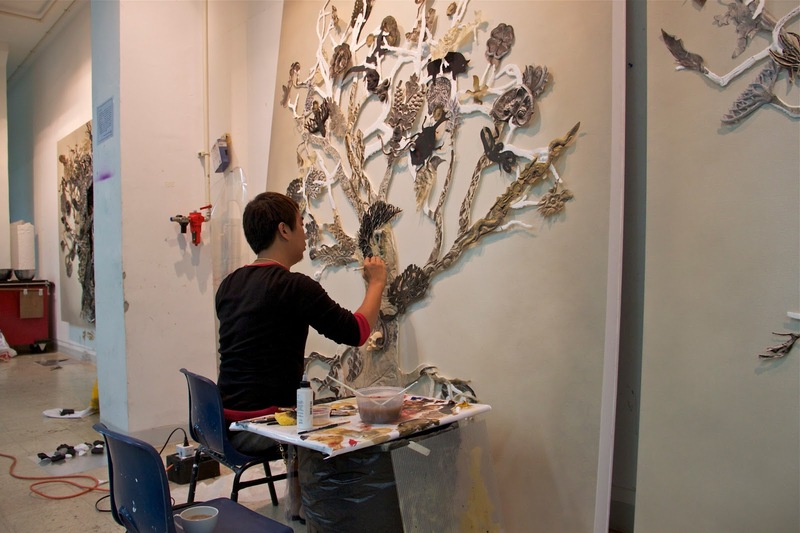 In his latest show, “recyclables,” held at the Singapore Tyler Print institute, 70 percent of the works were sold by the morning of the opening. Ventura’s plan to set up a private museum to present his own works, as well as the collection of Filipino contemporary art he has slowly accumulated, is little more than a hope for the future, “maybe in three to four years’ time.” For now, he remains tight-lipped about the “other” Filipino artists he has been collecting. “I don’t want to make any [other artists] jealous ... but I do buy a lot. There are a lot of good artists in manila,” he quipped while relaxing in the private exhibition room of the Singapore Tyler Print Institute (STPI). A few hours later, at the show’s opening reception, Ventura appeared in a black t-shirt with a black jacket by Maison Martin Margiela, a label known for its understated approach. But he had paired these simple items with white jeans he had hand-painted with an elaborate, graffiti-like design. The contrasting fashion statement is a reflection of the artist’s personality: behind his quiet, soft-spoken demeanor lurks an edgier side that Ventura lets loose in his artworks. Ventura loves nothing more than to subvert familiar cartoon figures, such as Mickey Mouse or a dwarf from Snow White, giving them a “new reality” with the help of a skull or a gas mask. 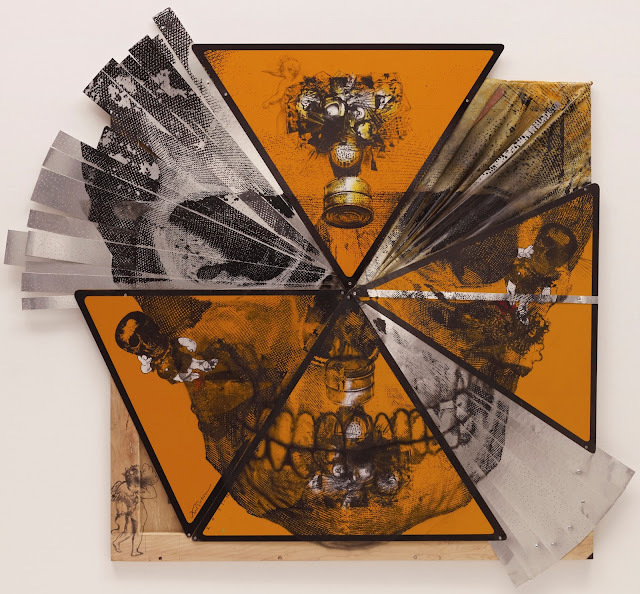 The artist has risen to prominence on the Asian contemporary art scene with complex, layered works that juxtapose unexpected images, often rather dark — internal organs with flowers and butterflies, or a clown and a gas mask — always rendered with exquisite draughtsmanship. He is known for mixing different styles, such as hyperrealism and Surrealism, cartoons and graffiti. Importantly, Ventura has a proven ability to surprise viewers (and collectors) by offering new works that incorporate familiar images, using different mediums or fresh layering to create intricate compositions that remain identifiably “Ventura” while nudging the envelope a little further each time. “Actually there is no such thing as new. We just discover something by looking at it a different way,” he muses. 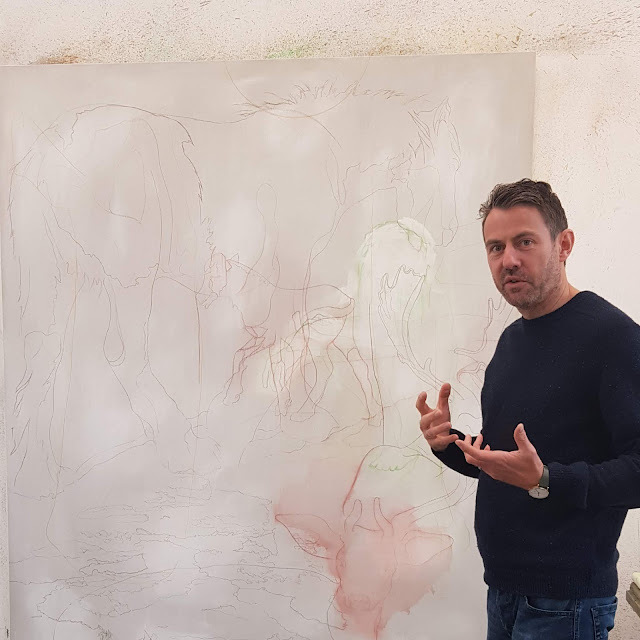 For his recent “Fiesta Carnival” exhibition at Primo Marella Gallery in Milan, Ventura found inspiration in the amusement park of his childhood, a place his parents used to take him and his siblings on weekends and holidays. This memory was the starting point for a connection between the Filipino and European cultures of carnivals. With his STPI works, Ventura approaches the recycling concept from different angles. He not only uses recycled paper, but his “Into the Woods” series incorporates rubbings of traditional Filipino carved-wood panels and furniture. 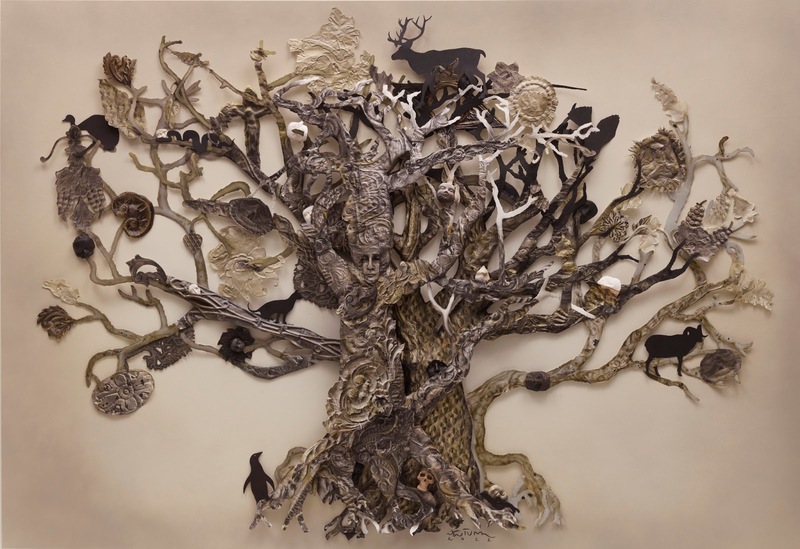 Reprocessing these images, as he so often does in his practice, Ventura created paper trees made from casts of these salvaged wooden pieces—a symbol, he says, of how art can come full circle. Animal shapes and human faces are fused into the trees’ branches and trunks, reflecting the life forces associated with nature. 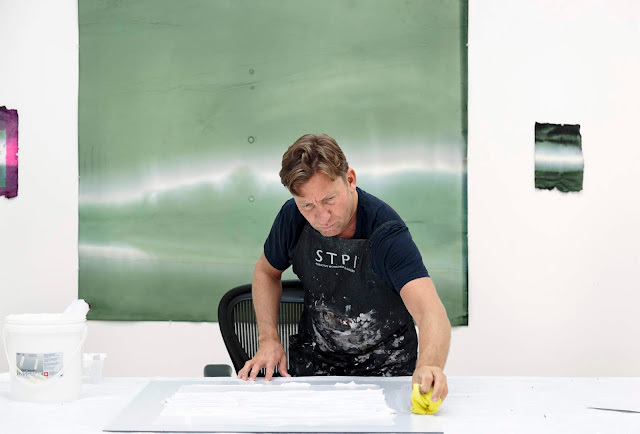 Ventura is currently working on a new solo show for Galerie Perrotin in Hong Kong, where he plans to show his first shaped-canvas series. There are also plans for a 2014 mini retrospective of sorts in Lugano, which will include a selection of works held by European collectors as well as pieces from his recent “Watching the Watchmen” exhibition at the Jorge B. Vargas Museum in Manila. 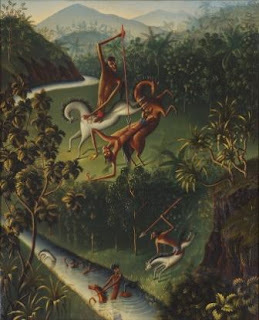 “The Lugano museum is collecting artifacts from the northern part of the Philippines, so there is a real connection here with ‘Watching the Watchmen,’” explains Ventura. “That’s very interesting to me.” Ventura was inspired by the bulol, a wooden rice god found in the northern Philippines, which symbolizes wealth and protection. (The bulol stands guard in granaries.) Ventura gave the indigenous icon a contemporary feel, transforming his figures into toylike anime characters cast in resin, revealing sinew, muscle, and bone, tattooing them with images of Christ, skulls, and tribal patterns, or morphing them into Pinocchio-like figures with long pointed noses. Ventura has always stressed he’s not interested in the hoopla that has surrounded the price of his works at auction. But he admits it has given him international recognition, and a voice. Now, he wants to use that voice to promote broader Filipino culture internationally. This article was published in the January/February issue of Blouin Artinfo.com Asia Edition.